The vast majority of big city train stations in Japan don't look scary. That is, unless you are afraid of crowds. This one in Yokohama, however, looks spooky as all hell. Recently, a 2ch user posted photos of Kokudo Station online. The images as well as ones posted by Twitter users are truly creepy. The station has an interesting history. Akira Kurosawa used it as a location for his 1949 crime classic Stray Dog. 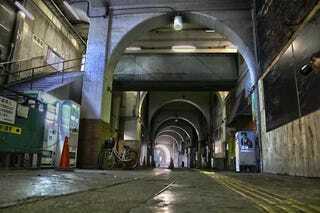 Numerous films and TV shows have used the station as a setting for its eerie mood. Since 1971, Kokudo Station has been unstaffed, making it even creepier. This station totally belongs in a survival horror game. That, or my nightmares.